D. Preman Niles is past General Secretary of the Council for World Mission in London. - Publisher Taking into account that all religions are missionary, Niles challenges Christians to rethink mission in a way that reflects the realities of our present world, including the reality of religious plurality. He looks at three understandings of people from the point of view of Christian mission and how the three ought to interact. Using three Greek words to distinguish and relate these concepts of people, Niles explores the ways in which the laos (the Christian community) could relate with reciprocity to the ochlos (the multitudes, the marginalized, and deprived) and to the ethne (religio-cultural entities) so that the laos could be a blessing to the peoples. He argues that only churches that manage these relationships in a reconciled and creative way within themselves can respond to this new missionary challenge. 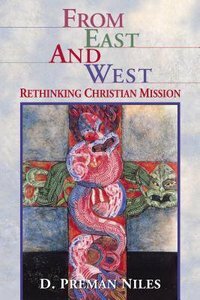 About "From East and West"
Taking into account that all religions are missionary, Niles challenges Christians to rethink mission in a way that reflects the realities of our present world, including the reality of religious plurality. He looks at three understandings of people from the point of view of Christian mission and how the three ought to interact. Using three Greek words to distinguish and relate these concepts of people, Niles explores the ways in which the laos (the Christian community) could relate with reciprocity to the ochlos (the multitudes, the marginalized, and deprived) and to the ethne (religio-cultural entities) so that the laos could be a blessing to the peoples. He argues that only churches that manage these relationships in a reconciled and creative way within themselves can respond to this new missionary challenge. Niles is past general secretary of the Council World Mission in London, England, and previously held executive positions with the World Council of Churches and the Christian Conference of Asia.